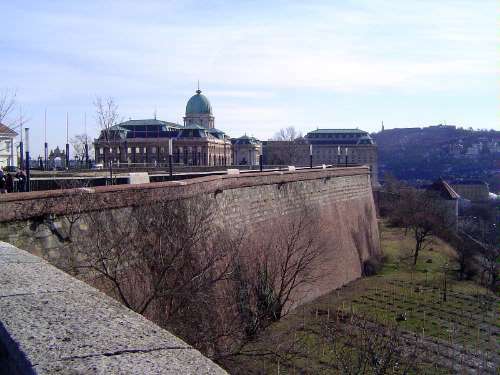 It's time to take a look at the hill that overlooks Pest from the other side of the river. 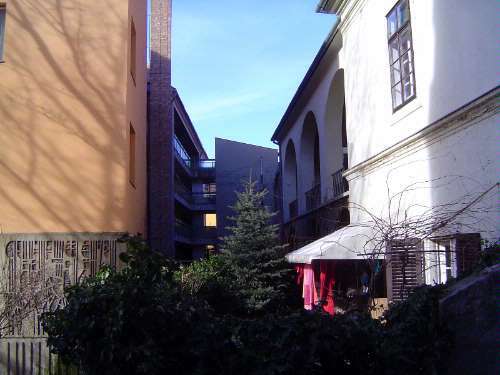 Welcome to Clark Square, named for Adam Clark (1811-1866), a Scotsman who oversaw construction of the Chain Bridge. 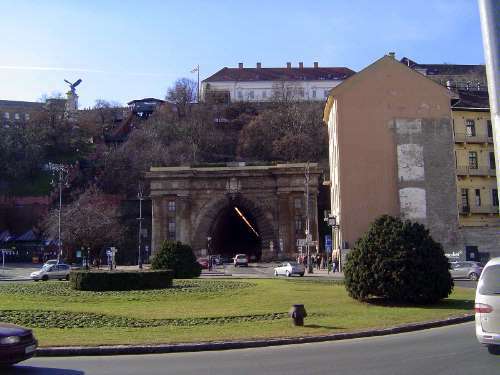 We're standing at the western or Buda end of the bridge and looking at the Buda Tunnel, which Clark also oversaw. It opened in 1857 and allowed traffic to go straight through the hill rather than find a way around it. 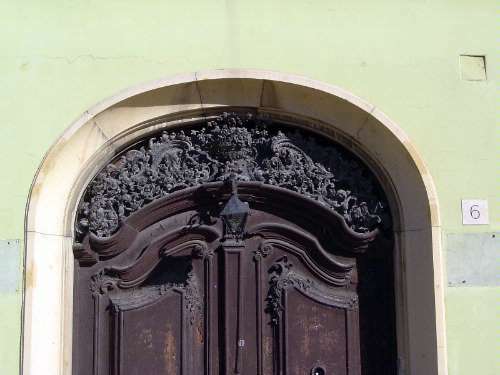 Up top, at the entrance to the palace, there's another Turul bird, similar to the ones atop the Liberty Bridge. Between the bird and the tunnel there's a funicular elevator. This traffic circle, by the way, is the zero point for measuring highway distances in Hungary. Farther downstream, caves in the hill were occupied until 1900. 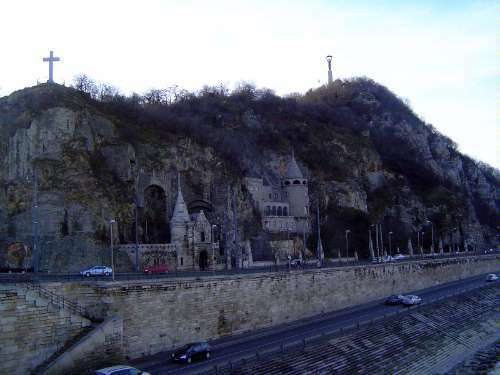 A church was created in the caves in the 1920s, was destroyed in 1951, and re-opened in 1991. 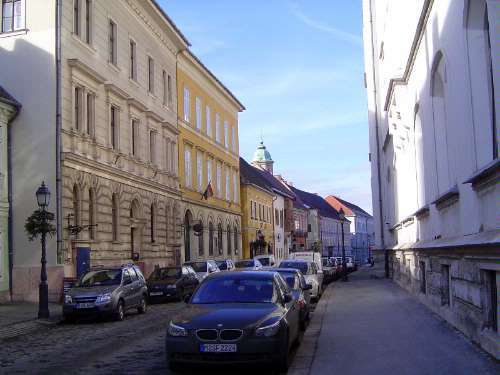 Across from those caves is the Gellert Hotel and Baths, completed in 1918 in, as Heathcote says, a "marriage of undulating Magyaros language and grand baroque eclecticism." Time to go up top. 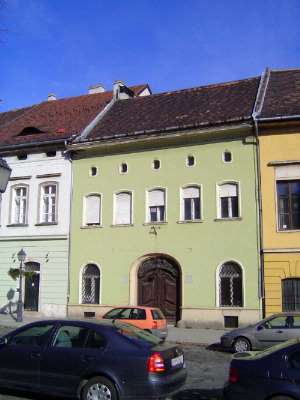 The site has had palaces for a long time, at least as far back as 1247, when a palace was built by Bela IV. The Turks took over in 1526 and were not dislodged until 1686. Little survived from the battle to dislodge them. 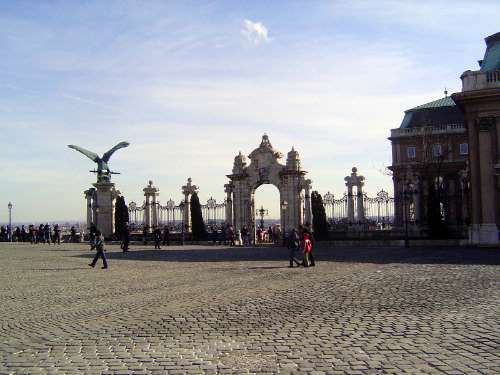 A new palace was begun in 1714 by the Habsburg King Charles III, and his daughter, Maria Theresa, extended the work. A fire in 1810 destroyed much of what they built. 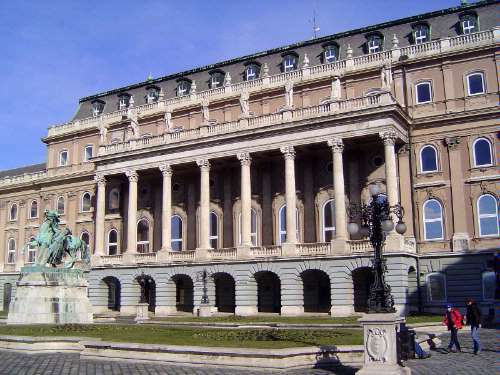 Again the palace was reconstructed, with the dome appearing after 1867. 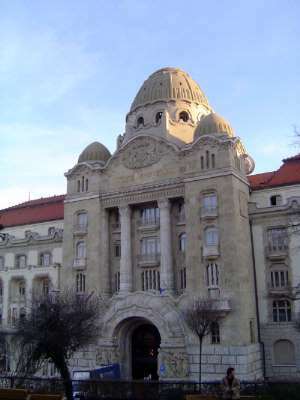 Extensions were added around 1900 by Miklos Ybl, designer of the city's opera house. 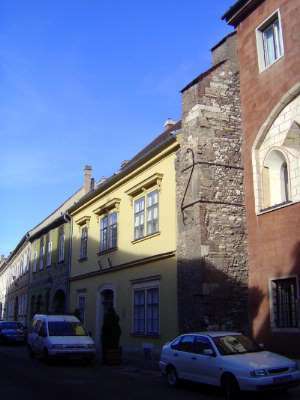 Damaged again in World War II, restoration began yet again in the 1950s. 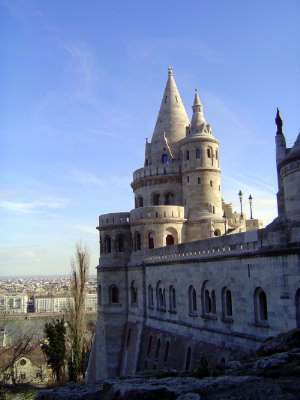 The palace attracts large numbers of visitors, often drawn to the view. 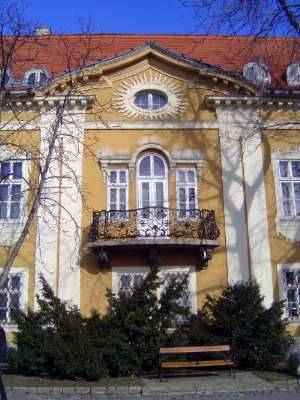 The facade facing the river. It's all post-war, except for the equestrian statue. 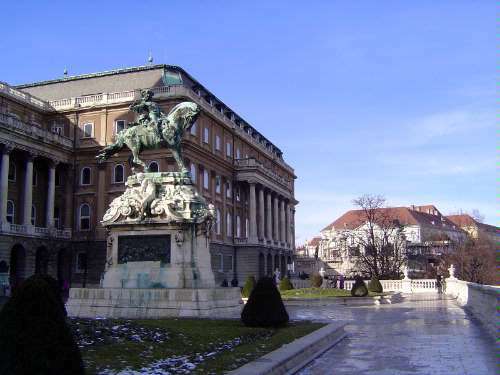 Prince Eugene (1863-1736) was a soldier in the service of the Habsburgs. He protected them on one side from the French and on the other from the Turks, but his position here is almost accidental. 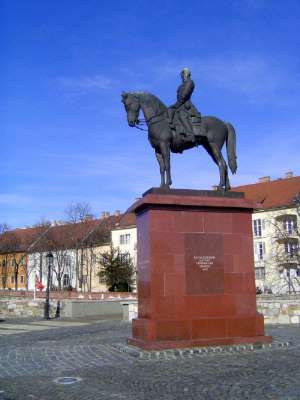 The statue, by Jozsef Rona (1861-1939), was placed here when Zenta, the town commissioning the work, could not afford it. The plan was to replace the statue here with one of Franz Joseph, but that never happened, so Eugene has kept his accidental perch for over a century now. 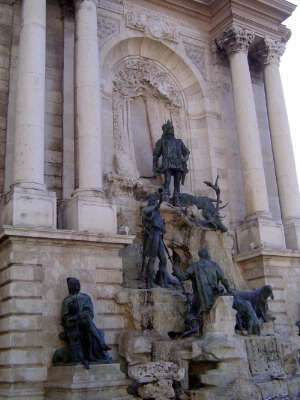 The intricate Matthias Fountain or Jagdbrunnen, showing King Matthias Corvinus with hunters and hounds. It's late--from 1896--and was created by Alajos Strobl. 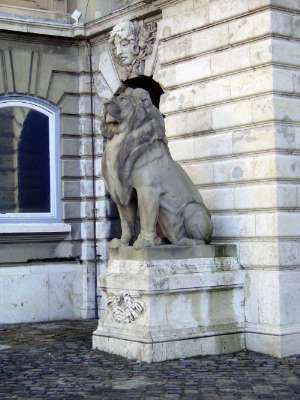 One of several lions by Janos Fadrusz, 1901. A nice illustration of pride so great that its possessor can hardly take a step without stumbling. 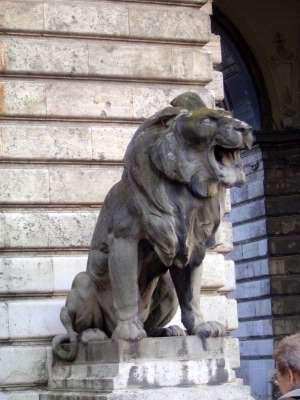 Around the corner, another lion, supposedly menacing but perhaps merely laughing at his stuffy neighbor. 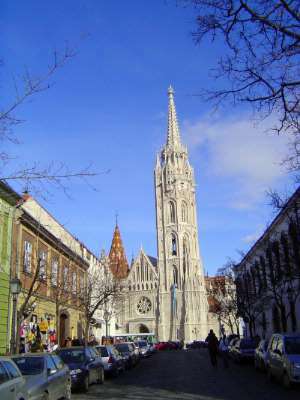 Close to the palace is the Matthias church, used as a mosque in the Turkish interregnum but restored as a church late in the 19th century by Frigyes Schulek. Schulek wasn't content to fix up the church. 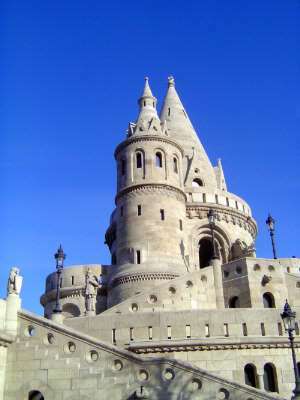 Next to it he added the extravagant Fisherman's Bastion, which looks like a medieval icon but is far too perfect to be any such thing. Disney could hardly have improved on it. Meanwhile, the hilltop is big enough for a residential district. 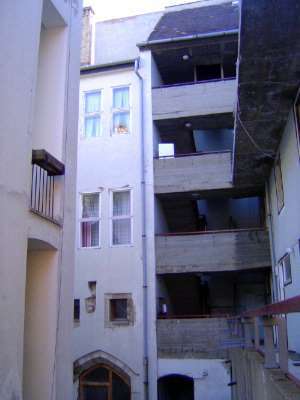 Some of the houses are relatively simple. "Relatively," because ornament is not wholly suppressed. Some have good views and pretensions of their own. They share space with various monuments, including this one, to Gyorgey Artur Miklos Barabas, 1818-1916. A near centenarian and one-time minister of war, Gyorgey Artur also spent 19 years in prison after surrendering his forces to the Russians in the belief that there was no other way to live. Eventually he was pardoned. This statue was erected in 1935, when his reputation had been restored. Some houses up here have the gravitas of age. Others have had their views blocked by new construction. Some of that new construction is pretty crude.